(Editor's Note: Due to an unavailable editor, Sarah's column is appearing a day later than its usual Thursday slot. Enjoy... and get out in your garden this weekend! 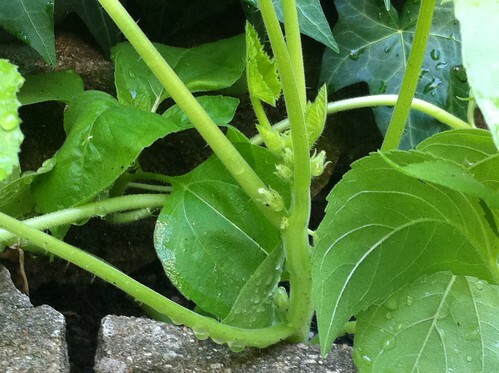 - DP) [caption id="" align="alignnone" width="500" caption="Garden on June 16th"] [/caption] This is getting fun! (And I don't mean writing...that's always fun.) I mean this gardening thing! Up until the last few weeks I'd been worrying so much...what if everything died? What if everything got eaten by bugs or, worse, I missed a day of watering and I killed all the plants? I was away the first really hot weekend here (Memorial Day) and I was a mess on the drive home, picturing piles of dead, brown plants awaiting me. But after doing this garden thing for a while now - 2 months if we count from the time I've been writing about it - I've realized that I don't have to be quite so nervous. Plants grow. It's what they do. As long as they have dirt and sun and water they're going to grow pretty much no matter what. 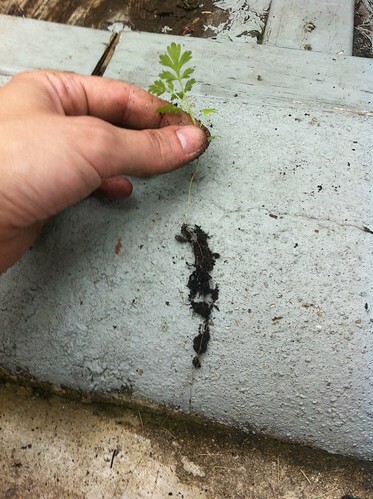 In fact, the other day I saw some of the little basil that I had thrown in the compost bucket had found some dirt and was growing! It's actually harder to keep something from growing than to grow it, which makes a lot of sense from a biological perspective but for some reason I was worried that wouldn't be the case. When I first started this I also thought it would be chore to tend to the garden almost every day. Not so! I actually look forward to my time in the garden every day (or almost every day - as long as it's not too hot I can skip a day and not freak out about it) because I can watch my little monkeys grow and remember once that they were all just seeds. It probably helps that green is my favorite color so seeing so much green is nice, especially in the city. Weeding can definitely be a little tedious, but I like going around and checking each plant, making sure the ties aren't too tight around the stalks and moving the ties up as the plants get taller. The tomato plants all smell like tomatoes, the eggplant leaves are surprisingly soft to the touch and the sunflowers, squash and mint constantly surprise me by how fast they grow. 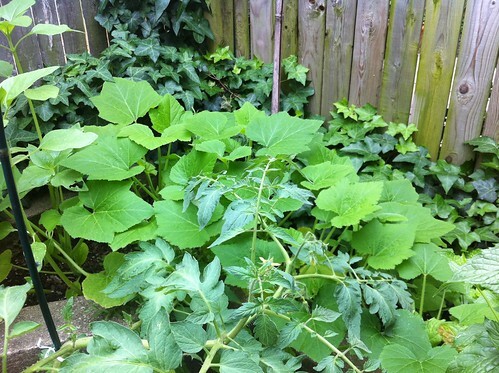 [caption id="" align="alignnone" width="500" caption="squash is taking over! watch out, mint"] [/caption] All this is just to say that this has been a lot more fun than I was expecting and it's nice that I trust my plants enough now to not be too worried when I see things like this: [caption id="" align="alignnone" width="374" caption="sad"] [/caption] This little tomato is in a particularly bright spot, probably the brightest in the backyard since the white door reflects light. It's looking dry and droopy because the pot is too shallow - it doesn't hold a lot of dirt so it dries out quickly and the roots get really hot and dry since there's no deeper place for them to go, where the soil would be cooler. By that same token I can't water it too much because the soil just doesn't hold that much water and I don't want to wash all the nutrients out. Basically I need to move it to a less bright spot or repot it. 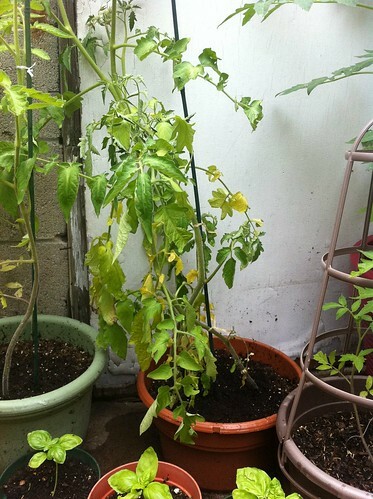 And that's the project for this weekend: repot this and a few other tomatoes that are outgrowing their little pots. This past weekend I repotted some other things: [caption id="" align="alignnone" width="500" caption="eggplant"] [/caption] [caption id="" align="alignnone" width="374" caption="and feverfew!"] 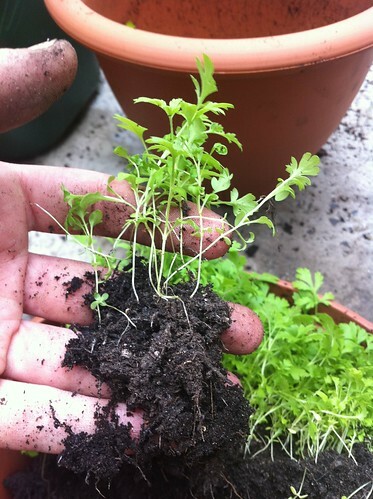 [/caption] You may have forgotten about my feverfew...I did! It was just sitting in the front window growing along. I would dump some water on it when I remembered to, probably a few times a week. Last weekend was the time to deal with it. 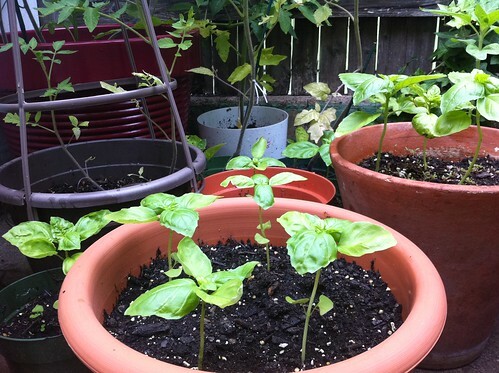 I thought about just thinning it out but, again, I find it very hard to just throw out little plants (those little basils I found growing in my compost? 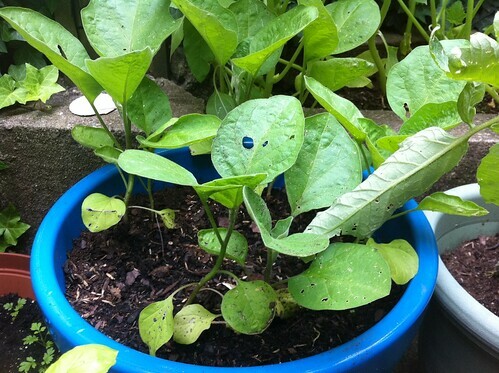 Yeah, I planted them because I figured they deserved it if they were willing to grow in a compost bucket.) At the same time, I've pretty much filled all the space in our backyard that gets sun with my other pots, so I was kind of stuck. But! Then I took the little feverfews and planted them in some of the bigger tomato and sunflower pots, and I have one pot that's just feverfew. I know I always say this, but the roots were insane! I mean, seriously: [caption id="" align="alignnone" width="374" caption="the roots actually continue on past the bottom of the picture"] [/caption] Wow, little monkeys! After I planted as many feverfews as I could fit, I may have gone out front and planted the rest around a tree that the city just planted in front of our house a month or so ago. But I'm not sure if that's entirely legal so I won't tell you for sure. I'm pretty happy with the basil: [caption id="" align="alignnone" width="500" caption="cuties"] [/caption] ...mostly because anytime I buy a little pot of basil in the supermarket (this has happened at least three times in the last five years) I always manage to kill it. Rationally I know that the pots are small and I probably forgot to water them that often, but somehow I think that when you grow things from seed you are kind of more in tune to when they're looking healthy or thirsty or too wet. I don't want to get too far into vibes or anything, but it's definitely true that plants have a rhythm and I think you need to understand that to feel like you know your plants. I can't believe I just used the word "vibes." Forgive me! In reality these basils are probably just healthier plants than anything you'd buy at a grocery store, but I like my seed theory. 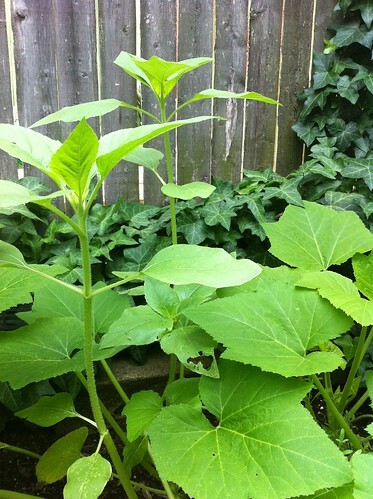 Finally, here are some sunflowers: [caption id="" align="alignnone" width="374" caption="growing towards the sun"] [/caption] Some of them are almost two feet tall. I can't wait for them to grow up against the fence. And here's some squash looking remarkably squash-like: [caption id="" align="alignnone" width="500" caption="squash is a great word"] [/caption] The tomatoes are all growing along, but all of the actual tomatoes are all still green so nothing too exciting yet. We'll see what next week brings! Sarah DeGiorgis has lived in Philly for five years and is finally starting to feel like a true Philadelphian, though she still detests cheesesteaks. She enjoys reading, watching bad tv, eating and cooking good food and digging in the dirt. 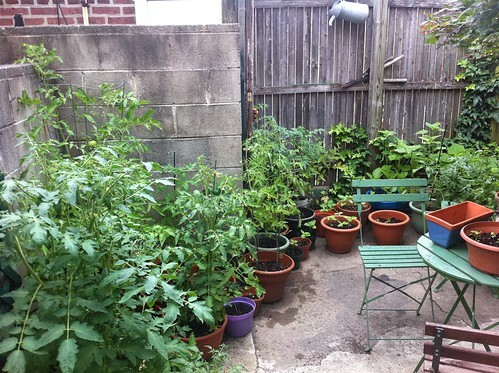 Catch up with her continuing efforts to grow food in South Philly by clicking here.